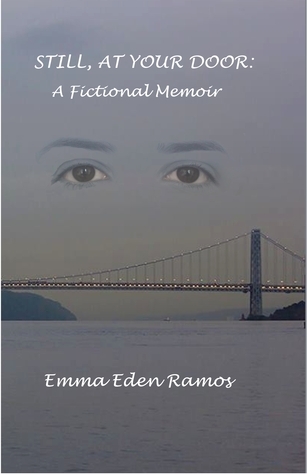 Still, At Your Door: A Fictional Memoir by Emma Eden Ramos is a powerhouse of emotion from the moment you begin. Sabrina Gibbons’ story is upended from the moment her mother drags them out of their abusive home in Butler, Penn, and drops them off with their grandparents in the Big Apple. Sabrina Gibbons’ past is just behind the scenes waiting to sweep you away as ‘Bri’ opens her journal, her memories, and her heart. She’s beginning a journey that’s much different from the one she’s been on with her mother, a journey full of promise and healing. ‘Bri’ is hopeful that her mother will return for her and her sisters — Missy and Grace — and that their lives as normal girls will end as quickly as it began. She’s the tempering force among her siblings, while Missy is as passionate and volatile as their mother, but Grace is just a typical youngster caught between her older sisters and things she doesn’t understand about her family dynamics. In addition to their new living situation, Bri and her sisters also must contend with being the new girls in school and all the peer pressure that comes with that. After being “homeschooled” by their mother and shuffled from town to town, they face even more pressure to conform than they expect. As Bri tries to live a normal childhood, keep her grades up, and deal with the teens at her school who see her and her sisters as an outsider, she’s also secretly hoping for her mother to come back to bring them home. As their lives become more settled and Bri begins to find herself at ease, events conspire to push her and her family over the brink. When the school opts for A Streetcar Named Desire as the play they will put on, Bri impulsively decides that she must try out for the role of Blanche, the role she saw her mother play years ago. A role that took on a life of its own, but despite her plans, life has its own ideas. Like New York City, Still, At Your Door precariously teeters between nightmares and dreams, exploring mutual dependence where one wrong step over the threshold can lead to disaster. Emma Eden Ramos is a writer and student from New York City. Her middle grade novella, The Realm of the Lost, was recently published by MuseItUp Publishing. Her short stories have appeared in Stories for Children Magazine, The Storyteller Tymes, BlazeVOX Journal, and other journals. Ramos’ novelette, Where the Children Play, is included in Resilience: Stories, Poems, Essays, Words for LGBT Teens, edited by Eric Nguyen. Three Women: A Poetic Triptych and Selected Poems (Heavy Hands Ink, 2011), Ramos’ first poetry chapbook, was shortlisted for the 2011 Independent Literary Award in Poetry. Emma studies psychology at Marymount Manhattan College. When she isn’t writing or studying, Emma can usually be found drinking green tea and reading on her kindle. Please read an excerpt.